I’m in a new relationship that came in a two for one package deal! :) My boyfriend and his little eight year old daughter named Angela. I do not have kids of my own, so there’s a lot of new experiences that I’m going through, like this one that was really cool. This was our first Halloween as a family and Angela’s grandmother had picked out a costume for her for story book day at school. Angela looked so sad about it, I asked her why. She explained that every year, for every story book day, she always had to be something she didn’t want to be, and also her costumes were not real costumes! It hurt my heart, so I decided to do something about it. I have been sewing for the past year making dog sweaters, I have never made anything for a human being, but I wanted her to have a great Halloween story book day at school. The best ever! So I asked her if she would like to try to make her costume with me that year. She said “yes!” So then I went to work. 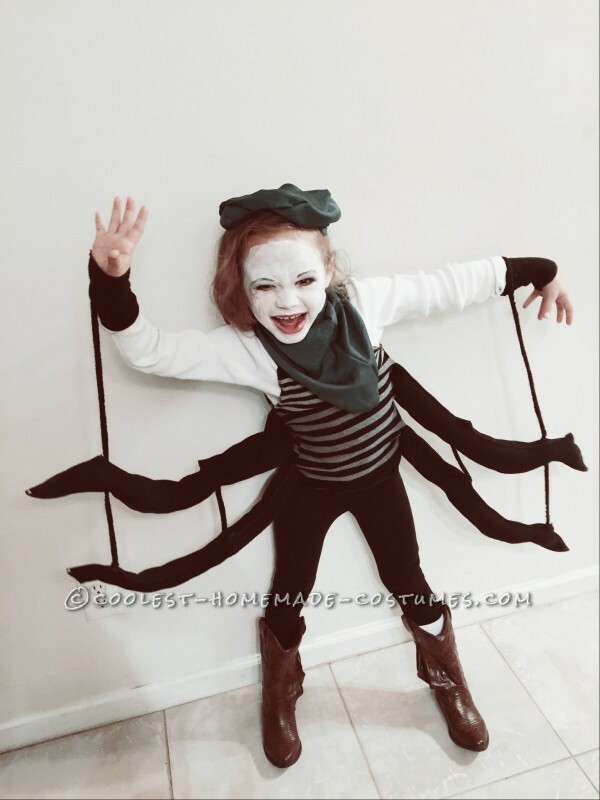 Angela wanted to be Miss Spider, the character from James and the Giant Peach. I went through my material, gathered what I needed. 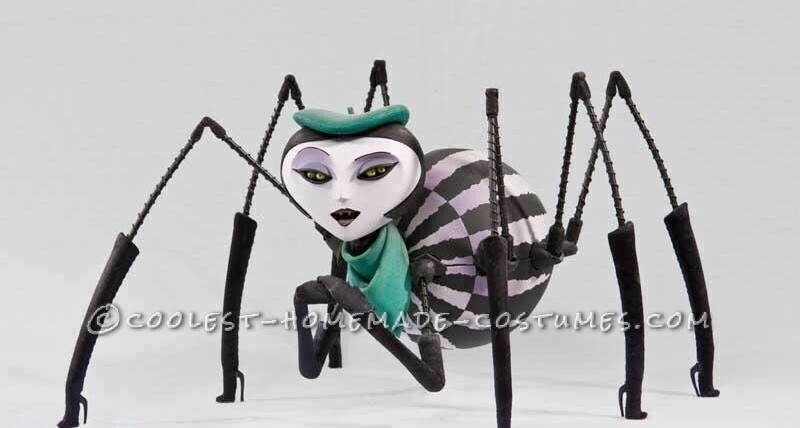 I looked up Miss Spider’s photo and drew out my design, took her measurements before bed. I started with the arms. I felt like that was going to be the most challenging part. I had my material out and cut the design incorrectly, but was able to still use the same material to make them after I made the corrections for the shape. While I was stuffing them, I thought “woah, these things look so creepy, but cool!” It was so much fun, I couldn’t wait to see the ending result. Then my left needle broke on my serger. I was like “no!”, I just put her to bed and I couldn’t leave the house, so I called mommy to rescue me. She was sleeping, but woke up and came to bring me some more needles to use. Without her, I would have been stuck until Angela’s father came home from work which would have been really late. After a while, I got the needles, gave a huge hug to my mom and continued working. I had Angela’s shirt laid out to make the stripped tank. I cut out from one of my sweaters and made the hat and scarf from a green dress my niece threw away a few years ago because she didn’t want to wear to a wedding, and I had kept it. I knew I would be able to use the material for something one day! I’m so glad I kept it because the color worked out perfectly, but never thought I would be using the material for this! Making the hat, I didn’t get the measurements for her head, and I didn’t realize until after Angela went to sleep. I thought if I was quiet, I could get it while she slept. Then I thought, “nope, would be so creepy to wake up to a large women standing over you measuring your head”, LOL! So, then I had to guess and the hat came out pretty awful, believe it or not. I actually had to pin it to her hair for it to lay it down, which worked out wonderfully. And honestly, with her running around, at least I know she wouldn’t lose it. LOL! AND FINALLY ( after a few hours) IT WAS FINISHED. Held up my work and took a step back and I simply loved it and couldn’t wait to see her face when she saw it. I was hoping she would like it. The next morning she rose up so excited. 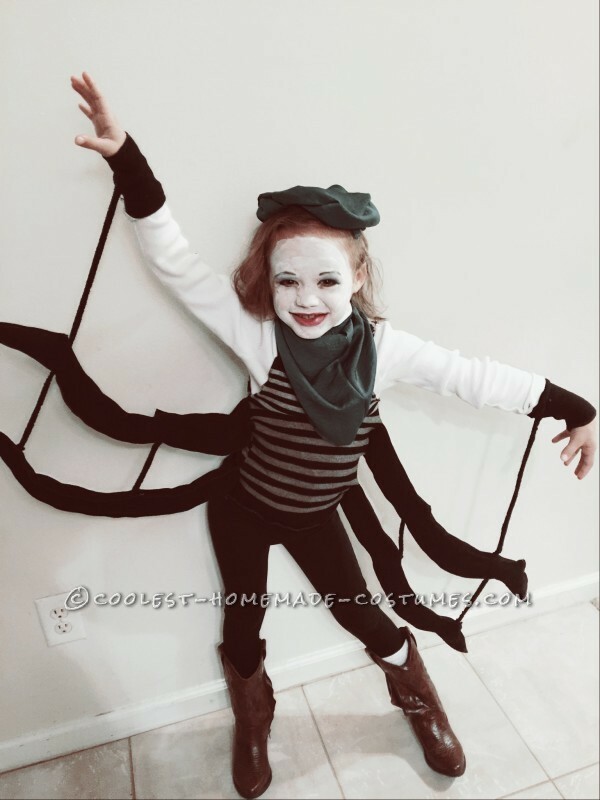 I brought the costume to her and said “look, you have arms!” Angela gasped, jumped up and yelled, and put it on as fast as she could! It was so adorable. After breakfast, we applied the make up. She was so happy; it was like someone gave her wings to fly. We went straight to school and she ran inside with a huge smile on her face. She couldn’t wait to show her costume. I had to wait all day until after school to hear what happened. It was tough! Finally, upon picking her up, her teacher came to me with a huge smile on her face and told me that the entire gym has a daily normal noise level everyday. But today was different. As soon as Angela entered the room, she raised the entire noise level in the cafeteria. She told that the kids yelled and shouted her name because of the costume. Everyone loved it and were amazed, and she was so happy to see that kind of excitement at the school. It was so cool to hear that I did not think the costume was going to effect the kids that much. It made me so happy and even happier to see Angela walking to the car with me with the biggest grin on her face. I’m pretty sure that was the best school day of the year for her. A few weeks later, teachers and students still spoke about it. She sometimes felt kind of an outcast at the school, so I know it made Angela feel a lot better and not so much like an outcast. She felt special with all the positive attention from her peers and teachers. Really great times, best Halloween ever. Thanks for reading! Means a lot to share this story with the world. It’s amazing what a little sewing and a lot of love can do! Thank you. That was the very first costume I ever made, and I will treasure the memories forever.